That statement is by Fr. 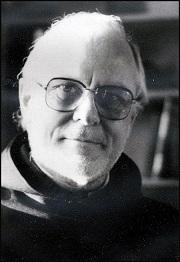 John Main, the Benedictine monk who years ago taught my wife Martha and me the way of contemplative prayer. I was listening recently to a tape of his with a church group who gathers regularly to meditate, and for the first time in 20 years I realized why I was so drawn to this type of prayer at that time in my life, when it was such a rare practice among Christians, especially Protestants. Martha, who was 50, had just been diagnosed with Alzheimer’s disease and our life was collapsing before us. We desperately needed something to hold on to, something real. Our friend and mentor Rev. Lacy Harwell introduced us to John Main’s practice of silent prayer. With his encouragement, I searched online for Main’s material and ordered his book Word into Silence and a set of tapes, In the Beginning. Martha and I soon began to meditate together for 15 minutes or so, both in the morning and early evening when possible. This practice did help stabilize our feelings in this ever-churning crisis. And it drew me—and Martha, too, I think—into an intimacy we’d rarely experienced in our 25 years of marriage. John Main’s thrust was to move the practice of meditation beyond monastic walls, to reach those of us who lead rather hectic lives juggling work, family, friends, hobbies, and whatever else. While not delving into the actual practice of meditation with this post, I do want to share with you a website I stumbled onto a decade ago—the Contemplative Life Bookstore. It’s as complete a resource center as I’ve found. I understand that not everyone is interested in this kind of approach to silent prayer and stillness—whether it’s called contemplation, centering prayer, Christian meditation, lectio divina, or something else—but if you’re the least bit curious you may want to check out this website. Joe Doerfer says he opened the site in 2003 in partnership with the World Community for Christian Meditation (WCCM), the organization that evolved after John Main’s death in 1982. Talking with Joe, this resource center sounds more like a labor of love than a profit-making business. Back in the ‘70s, Joe got into Transcendental Meditation (TM) “because of my job’s high stress.” Much of his career was spent in the competitive field of book printing and binding. Raised Catholic, Joe practiced TM for about five years until his interest faded. After a heart attack and open heart surgery, he sought to understand more about how to maintain a healthy heart. In his search, he got quite the surprise when he came across a book called The Good Heart. It turned out to be by the Dali Lama and subtitled “A Buddhist Perspective on the Teachings of Jesus.” The book is a transcript of a London retreat the Dali Lama headlined in 1994 at the annual John Main Seminar that is sponsored by WCCM. The more deeply Joe connected with WCCM, and because of his chosen career, he was asked to publish books for WCCM and to launch this website, which has broadened significantly since I first saw it. Joe now carries an inventory of about 200 books on various contemplative teachings and about 100 videos and CDs. From classics like St. John of the Cross’s Dark Night of the Soul and St. Teresa of Avila’s The Interior Castle to 20th and 21st century teachers like Thomas Merton, Richard Rohr, Thomas Keating, and Henri J.M. Nouwen. (For the sake of transparency, my book A Path Revealed was recently added to his listings.) Joe’s weekly e-newsletter of product updates is sent to 6,500 interested persons. When Martha and I began to meditate in 1997, I felt a bit heretical because I, in my ignorance, thought this was an Eastern religious practice cloaked in the form of Christian prayer. But I soon learned that within Christianity the practice could be traced as far back as the Desert Fathers and Mothers of the third and fourth centuries. Yet the practice goes even further than that within Christian and Jewish tradition: “And Isaac went out to meditate in the field in the evening…” (Genesis 24:63, RSV). And “…after the earthquake a fire, but the Lord was not in the fire; and after the fire a still small voice. And when Elijah heard it, he wrapped his face in his mantle…” (1 Kings 19:12-13). Over these 20 years, I’ve come to understand that such deep, sure truths like silent meditation—regardless of the forms they may take—are evidenced throughout the world’s great religions. If you do go to the Contemplative Life Bookstore website, avoid becoming overwhelmed; there are a lot of choices. Find an approach that you’re comfortable with, and go deep. P.S. If you’re interested and in this area, I’ll be sharing Martha’s story and mine at a monthly Book Talk at The Cathedral Church of St. Peter on Tuesday, April 4th, 12 Noon in the Parish Hall; 4th Street and 2nd Ave. N. in St. Petersburg; entrance is on the 2nd Ave. side. Admission is free; they offer a light lunch for $5. P.P.S. Feel free to forward this post to your friends and family. If you’d like to sign up for my blog, it’s free; just click here.